Halfords is one of the longest established retailers specialising in accessories for cars, bikes, camping, baby and child and mobility aids. Car accessories including mats, tyres, tools etc. The Halfords Online shop is the easiest place to check whether the items you want are in stock and also where you will find all sorts of special offers. Some special offers are ‘Web only’ but you can buy online and have the goods delivered to your door, or, you can reserve online and collect the goods in store. Standard delivery charges depend upon the size and weight of the goods. They start at only £1.99 for small items, by Royal Mail, going up to £24.99 for very heavy goods by courier delivery. Each delivery cost is clearly indicated at the checkout. 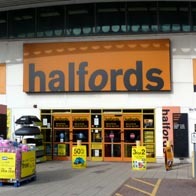 Any unwanted goods can be returned within 28 days to the local Halfords store, or by post in its original packing.